So, WHAT is a Drone, anyway? a UAS (unmanned aircraft system). 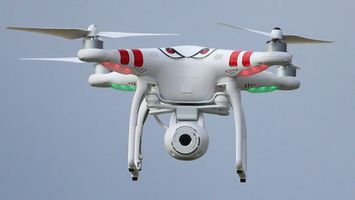 A drone can be flown and controlled by a human operator or by computers. that were considered too "dull, dirty, or dangerous" for humans. with estimates of over a million sold by 2015.
arial photography, commercial and motion picture filmmaking, journalism, law enforcement, search and rescue, scientific research, weather monitoring, firefighting, conservation, anti-poaching, surveying, mapping, pollution monitoring, industrial exploration and production, disaster relief, archeology, cargo transport, traffic monitoring, agriculture, and more. ​Would you like to learn to fly a drone? or develop a career flying drones? need to be registered with the FAA. The registration fee is $5. The registration is good for 3 years and can be renewed for an additional 3 years at the $5 rate. A single registration applies to all UAVs owned by an individual. and criminal penalties of up to $250,000 and/or imprisonment for up to three years. and keep it present at all operations of the UAV. Remote Pilot in Command Certification is available to any citizen at least 16 year old. The Certification is obtained by passing a written text and submitting an application. a rule-specific exam can be taken at no charge online at the faasafety.gov website. Other applicants must take a more comprehensive examination at an aeronautical testing center. All licensees are required to take a review course every two years. Applications may be submitted when the system begins operation on 29 August 2016. At this time no ratings for heavier UAS are available. though it is estimated more than a million have been sold in the United States alone. See drone video footage and browse video profiles of real-life drone operators. Get trained to operate a drone. Toys (1992) - child soldiers train to fly UAVs. The Bourne Legacy (2012) - a predator drone pursues the main characters. Body of Lies (2008) - the CIA uses drones for surveillance of the main character in Iraq, Jordan, and Syria. High Flight Media utilizes a highly modified, custom quadcopter for aerial videograhy and aerial photography projects in NM. is the first company in New Mexico authorized by the FAA to use sUAS/UAV's also known as Drones for Surveying & Remote Sensing Practices, Volo Pervidi LLC provides stunning, accurate, and timely data and services including topography, orthophoto, 3D modeling/LiDAR, Bath Metry, Thermal Imaging, Utility Inspection, NDVI Precision Agriculture, Mining and Construction, Videography and Real Estate Advertising.